Khichdi in all its versatile avatars is ‘food for the soul’, be it the simple khichdi, masala khichdi or the ghee-laden, rich dal khichdi. 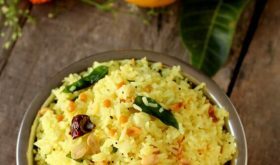 They’re numerous versions and variations to the humble khichdi based on each region of the Indian subcontinent. 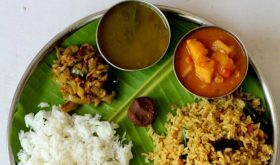 Each home has its own version in terms of the spices used, the proportion of rice and dal, the variety of lentils used and texture of the cooked khichdi. 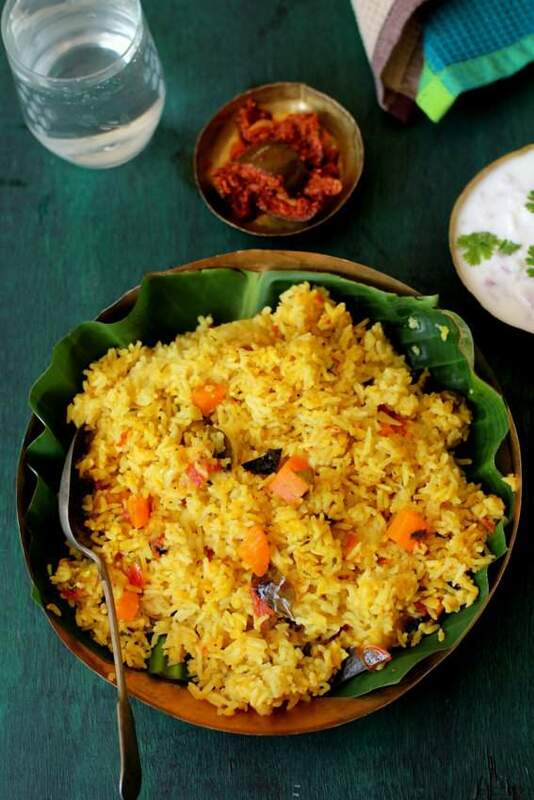 Masala khichdi = comfort food at its best! This my perfect go-to meal/brunch option on days when I am rushed for time or have minimal vegetables on hand and want to prepare a nutritious one pot meal for the family. 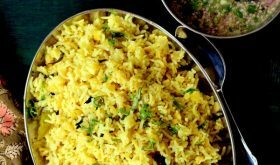 Masala khichdi recipe is an easy to make rice dish using few everyday ingredients. The addition of a few spices changes the flavour profile of the rice and lentil dish by leaps and bounds. Rice and dal are certainly a match made in heaven. Turmeric powder lends a beautiful yellow shade to the masala khichdi. I love the versatility of this dish that you can throw in any combination of vegetables or spices and you end up with a comforting flavour. 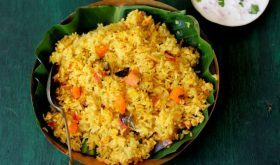 This instant masala khichdi can be prepared in the rice cooker or pressure cooker if you are rushed for time. Use whole Indian spices like cloves, cinnamon, star anise, cardamom and bay leaf instead of garam masala powder. The whole spices lend a gentle aroma and flavour to the rice and lentil dish without being overwhelming. You can add any mixed vegetables of your choice like carrot, potato, french beans, green peas, onions and tomatoes. 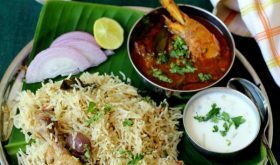 I prefer jeera rice which is also called chitti muthyalu in Andhra and jeeraga samba in Tamil Nadu. It is a short grain with an aromatic flavour. Whenever I make masala khichdi, I like to use mix dals which include yellow moong dal, arhar dal or tur and chana or split green gram dal. You can use a combination of ghee and oil to fry the vegetables. If you want a rich flavour use ghee. Having said that, I must mention that this instant one pot dish tastes equally good with vegetable oil. 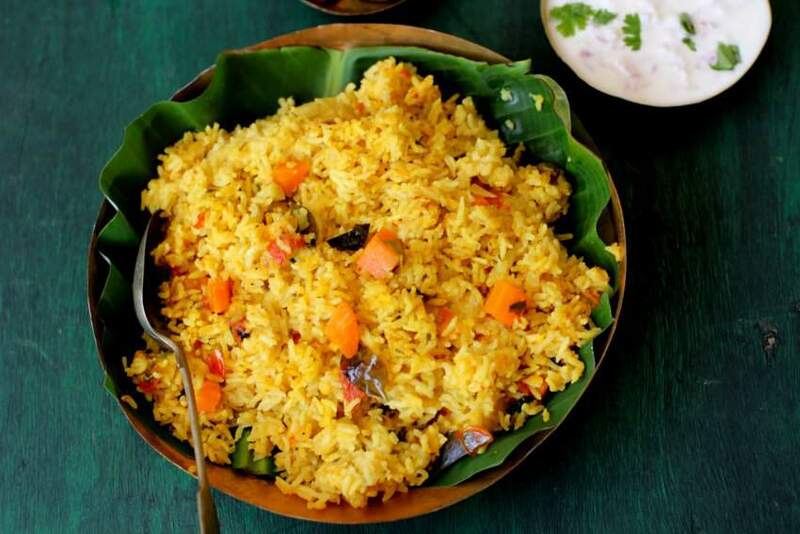 IF you want a soft textured khichdi, increase the quantity of water. 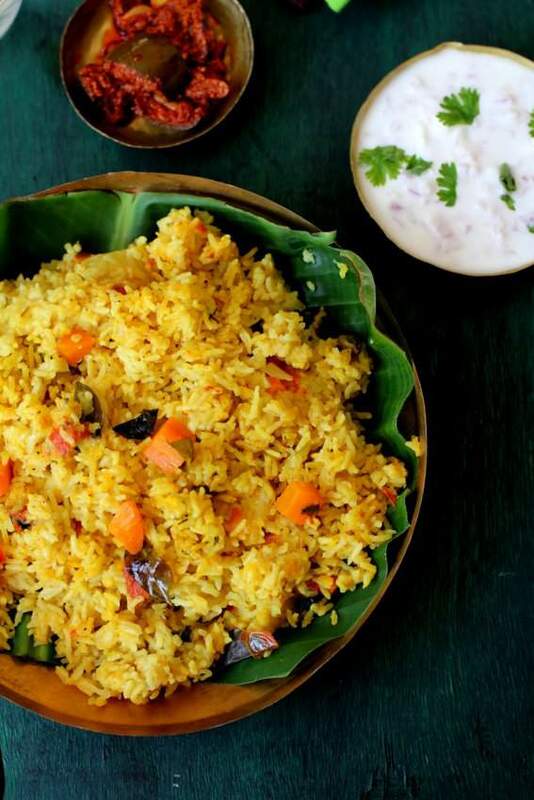 Those who are under the weather prefer a gooey khichdi which is light on the stomach. The soft textured, masala vegetable khichdi is a healthy and nutritious baby or toddler food. I like a firm textured khichdi. So for one cup of rice, use 1/4 cup of tur dal and 1/4 of moong dal and 3 cups of water. The stems of coriander leaves lend a lovely flavour to the khichdi along with aromatic curry leaves. You can serve the masala khichdi with any pickle of choice and yoghurt or raita. It makes for a complete wholesome meal for your kid’s lunch box. Wash the raw rice thoroughly. Drain water and set aside. Wash the mix dal thoroughly, drain water and set aside. Heat oil in a cooking vessel or pressure cooker. Once hot turns hot, add cumin seeds and allow to splutter. Add the cinnamon, cloves, cardamom, star anise and bay leaf. Immediately, add curry leaves, chopped coriander stems, grated ginger, garlic cloves and green chillies. Stir fry for few seconds. Add the sliced onions and saute until onion turn translucent. Add turmeric powder and salt and mix well. Add the chopped potatoes, carrots, and green peas. Cook on medium heat for 5 mins. Add chopped tomato and mix well. Saute with lid for 8 mins. Add water and allow the water to boil. If required adjust salt at this stage by tasting the water. It should be salty. Once the water starts to boil, add the washed and drained rice and mixed dal. Add chopped coriander leaves, if using. Place lid and cook on high for 3 mins. Reduce flame to low and cook till the water is absorbed and the masala khichdi is cooked. Allow the cooked khichdi to sit for 15 minutes and then open the lid. If using a pressure cooker, place lid and pressure cook up to 3 whistles. After turning off the heat, do not open lid for 10 minutes. 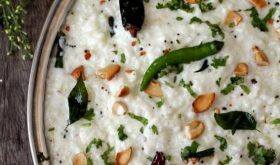 Remove the masala khichdi into a serving dish and serve with raita, yoghurt or pickle. For a soft and gooey khichdi, add 5 cups water. You can add 1 1/2 tsp ginger green chilli paste instead of grated ginger and slit green chillis. I like to add a fistful of finely chopped coriander stems while the onions are sauteing. It lends a wonderful aroma and flavour to the khichdi. I would be extremely grateful if you could guide me to cook this Khichdi in a microwave rice cooker. Simple and Delicious meal !!! It came out really good….. I tried it today and it turned out great. Thank u for nice recepi.